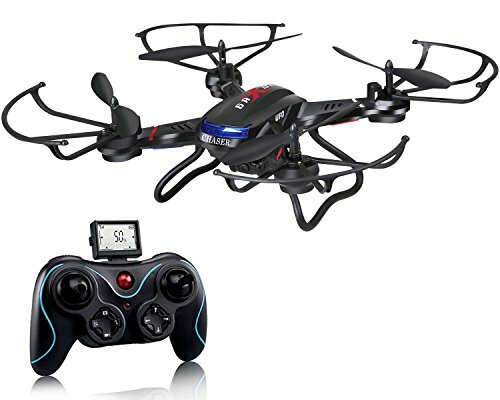 The Holy Stone F181 RC quadcopter drone is a budget-friendly device that many beginners and intermediate drone users are giving high ratings. In this Holy Stone F181 review, we will get into the details, evaluate the drone based on a set of criteria that includes price range-quality ratio, user ratings, usability, and customers' opinions, and give a few recommendations based on how the F181 rates. Read on to learn more about the Holy Stone F181 RC quadcopter drone with HD camera. Let's kickstart this Holy Stone F181 review by going over the drone's main specs. First and foremost, the Holy Stone F181 has a decent image quality for a budget-friendly drone geared slightly more toward beginners. The F181 drone's HD camera has a still shot resolution of 1280x720. As for its video quality, the F181 gets 30fps (frames per second). In terms of weight, the Holy Stone quadcopter is extremely lightweight, coming in at just under 0.5 pounds. Whether you intend on using the Holy Stone F181 for indoor or outdoor purposes, this quadcopter is built to function in a variety of settings. The helicopter features a 6-axis Gyro stabilization system which enhances stabilization and flexibility while flying. The Holy Stone F181 is surprisingly wind-resistant for such a lightweight drone. Flight time on the Holy Stone F181 is between 7 and 9 minutes. Holy Stone recommends taking a 10-minute cooldown period in-between flights. Circuit boards and motors heat up with use and will break down with wear-and-tear from heat, so it is important to allow them time to cool down. The Holy Stone F181 is a remote-controlled drone. It comes with a Headless mode, which helps the joystick know where the drone is in relation to the control. In this mode, regardless of how the Holy Stone F181 quadcopter changes position related to where you are with the controller, forward will always remain forward, and backward will always be backward. The drone also has one key engine start/landing, as well as the one-key return function, which make it very easy-to-use and beginner-friendly. However, advanced pilots can also have lots of fun with the F181, as it has a 4-speed control mode, from low to high. The budget-friendly Holy Stone F181 RC quadcopter drone is a high-flying performer. The F181 drone can be used for indoor events or outdoors in almost any weather condition due to its stabilizing technology. There is a Key 360-degree 4-way flip capability which provides continuous rolls for great action shots. Just make sure you do not flip too many times since it will cause the copter to lose a lot of height and possibly come crashing down. Additionally, there is an upgraded Altitude Hold Function that keeps the Holy Stone quadcopter drone hovering at its current height while you ease your thumb off of the controller's throttle stick. If you do struggle to maintain control and have the F181 drone come crashing to the ground, its two bars will absorb a sufficient amount of the impact. The remote is similar to most video game remotes. There are joysticks on the upper-hand right and left sides with control buttons below for movement. You can press the right arrow button on the leftmost motion control pad to enter and exit Headless mode. Get ready to stock up on extra blades and battery packs for the Holy Stone F181. It comes with two 3.7V 750mAh LiPO batteries, but since they have short lifespans, you will probably want to invest in more. If you are on a tight budget but want a drone that produces quality images, the Holy Stone F181 delivers a performance that rivals some of its higher-priced competitors. Here are the highlights and downfalls we'll include in this Holy Stone F181 review. If you lose control and have the copter crash, it is nicely protected from serious damage due to the two stabilizing bars underneath it. The battery pack won't come flying out upon a crash landing since it is secure into a battery compartment on the underbelly of the drone. There are four modes of operation. The 25% mode is easy for beginners to operate. All required parts come in the box, and the drone is easy to assemble. There is no ventilation, so internal core components like the battery heat up quickly. When in Headless mode, the F181 will only fly in a straight line. So you need to maintain a clear line of sight with the drone at all times. There don't seem to be any higher-capacity battery upgrades. The controller will not stop beeping while in Headless mode. Let's wrap up this Holy Stone F181 review by noting that most of the reviews are positive. One customer notes that the camera is not fixed, unlike many other drones in its price range. Another customer reports having crashed the copter multiple times without sustaining severe damage. Multiple customers report that they received excellent customer service when a part failed on the drone. Unfortunately, several customers seem to have received faulty products that flew away on the first or second flight, did not respond to the land key, and were completely lost. The Holy Stone F181 Drone is not a perfect product (especially if you are unlucky enough to get a faulty drone). But for its price (under 100 dollars), you will be hard-pressed to find better quality. This F181 drone is built to take a beating and provides crisp still and video images with its 720p HD camera. Has this Holy Stone F181 review helped you? If you own a Holy Stone F181 or have questions about this drone, drop us a comment. We would love to hear about your experiences flying the F181! My son just received the Holy Stone F181 drone for Christmas. One minute the drone was flying just fine, in control with no issues, we flew it indoors and outdoors. Then upon resuming a flight, it went straight up about 50 feet, then flew horizontally on its own. We could not control its flight with the controller. Seemed like we had lost frequency with the drone?? It started initial flight but then had a mind of its own. Needless to say, all we could do is watch it fly into the horizon…never found it. Could this of been a faulty drone or did we do something wrong? Any ideas or suggestions would be appreciated.